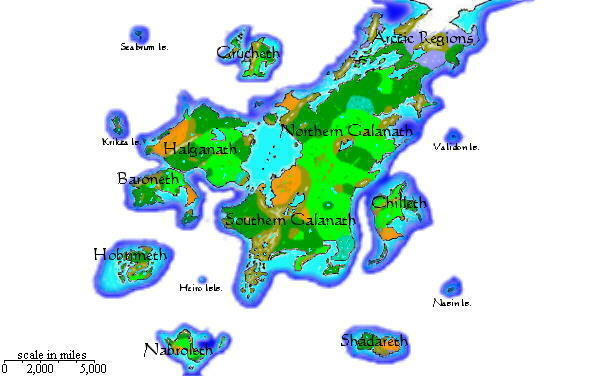 Most people across the face of Gaeleth will never see a map in their lifetimes. Those that do would likely see only bird's eye views of their own local villages or fiefdoms. Sometimes, though, a master cartographer or a king will possess maps that show the whole of the known world. Often such maps are inaccurate or out-of-date, but their mere existence is a wondrous thing, indeed. The globes below were built with GIMP 2.2. 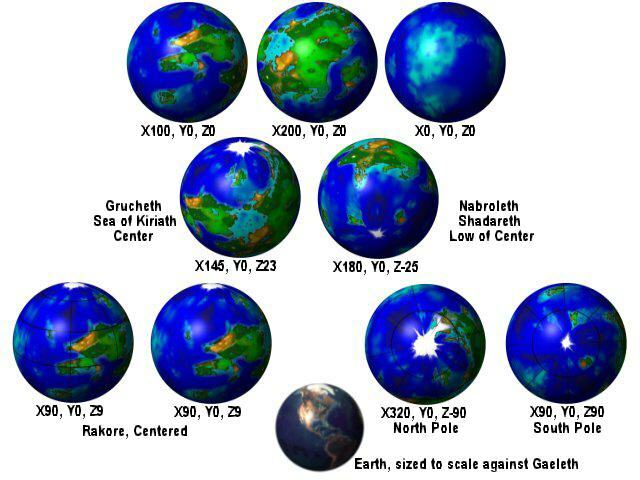 “If my calculations are correct,” then the earth globe shown is to scale with the Gaeleth globes pictured above. At 0 degrees longitude on Gaeleth, each 45 degrees is about 4,100 miles. Braven – Gaeleth pre-Storm Wars, circa 700 Avard.